Mike Oldfield, Jean Michel Jarre, Vangelis, Kraftwerk. By the end of 1992 I had composed well over 200 songs. At this time I used to Regularly listen to a program by Ashley Franklin on BBC Radio Derby every Sunday called Soundscapes, this was a 3 hour program which specialised in electronic contemporary music. This type of music is rarely played on mainstream radio stations in the UK even though it has a huge following. In America they have realised just how popular this type of music is, it is very easy to buy it at any record shop and there are regular nationally syndicated radio programs promoting it such as Hearts of Space which has been on over 300 public radio stations across the USA since 1983. I decided to let Ashley Franklin, the presenter of soundscapes have a copy of a tape of some of my compositions to see what he thought of them. To my surprise he liked them so much that he asked me to come into the studio and conduct an interview with me. This hour long interview was aired on BBC Radio Derby on Sunday 14th February 1993. I have put a brief extract from this show in the MP3 section lower down this page. Up until 2000 I had not released any of my music to anyone other than family and friends. But in the beginning of the 21st Century Midas Records of Derby decided that my music should be available to other people. I have created a "best of" collection of my tracks and produced a CD-R, This is available by mail order from Midas Records. It features 38 tracks with a total running time of 73 minutes 55 seconds. See below for further details and previews of the tracks in MP3's. 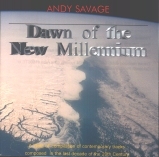 It is worth noting that my CD "Dawn of the new millennium" is on the CDDB database web site so if you play it in Media Player on any pc connected to the internet then it will show the track names for you ! 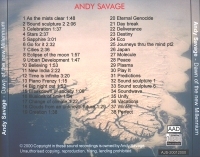 Here you can download extracts of my music to play on your PC, These tracks are all featured on my CD. To here one of the tracks below, simply click on the button to the left of the song title. This will invoke the standard File download dialogue. Depending on how you have configured your browser you may be presented with a suitable MP3 player at this point or you can choose to save the file to your hard disk for playing "off-line"
There are many available for free on the internet. All tracks are encoded in MP3 format at 40Kbit/sec 22KHz Stereo, This is a Compromise between quality of sound, playback duration and download time. << Click a button to download an mp3. build up with further layers of piano, drums and then strings. drum riff with a melody floating on top of it. This is a floaty tune with a catchy melody. This a futuristic melodic tune. This is a melodic funky tune. 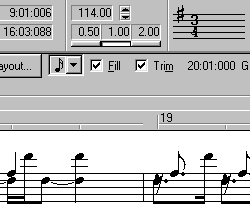 This tune consists of many layers which I build up gradually. 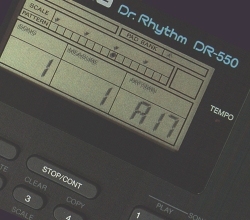 Based around a marimba note sequence with a simple bass line and drum riff. This is one of my favorite tunes. This is the first of a set of six sculptures that I composed. All music is copyright 2007 Andy Savage.